Funny Stuff Average 0.00/5 - out of 0 total votes. 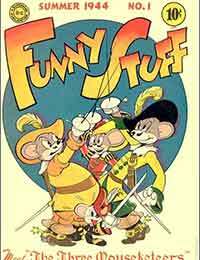 Although Super Heroes were still DCs bread and butter, the company made a preliminary entry into the funny animal market with the launch of Funny Stuff. Edited by Sheldon Mayer, the anthology title showcased a number of new animal humor features including; Rufus Lion, Blackie Bear, Bulldog Drumhead and McSnurtle the Turtle who could change into a super hero called the Terrific Whatsit. Series continued as Dodo and The Frog.